What Are Layer Styles in Photoshop CC? A layer style in Photoshop CC comprises one or more effects that surround or are applied to all the pixels on your layer. Effects that surround pixels include strokes (thin or thick outlines of color), shadows (just like the one you’re casting right now), and glows (outlines of semitransparent color). Effects that are applied to pixels include overlays of color, patterns, or even gradients. But Photoshop offers even more, including the ever-popular Bevel and Emboss effect, which does a great job of giving the content of your layer a 3D look. And, of course, effects can be used in combination; check out this figure for an example. You can add effects to layers in several ways, including through the Layer Style menu at the bottom of the Layers panel, as shown. Strokes, shadows, and bevels are just some of the effects available in Photoshop CC. Just so everyone is on the same sheet of music, when you refer to a drop shadow or an outer glow or a color overlay or any one of the other items shown in the menu, call it a layer effect or simply an effect. After you apply an effect to a layer or save it in the Styles panel, it becomes a layer style. A layer style can include one effect or several effects. 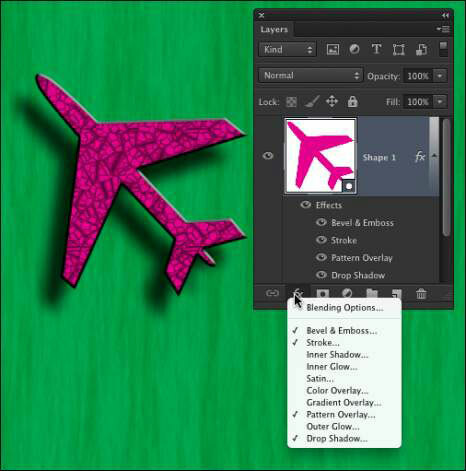 The individual layer effects are built into Photoshop, but you can add or delete layer styles and even create your own. By the way, Blending Options, at the top of the list, isn’t actually a layer effect; rather, it governs how the colors of the pixels on the selected layer interact with pixels on layers below. The check marks to the left of some effects listed indicate that those effects are already applied to the layer. You can add a layer style through the Layers panel. Some layer effects, such as drop shadows and outer glows, appear outside the content of the layer. 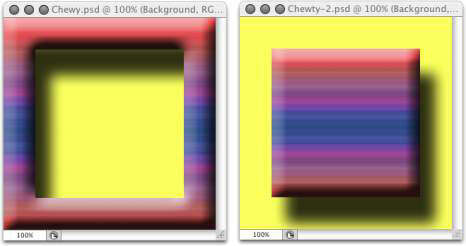 For those effects to be visible in your artwork, the layer must have at least some area of transparent pixels. If the layer is filled edge to edge, the effect has no place within the image to appear because the glow or shadow would logically be outside the image’s canvas. Take a look at a couple of layer style examples. In the sample on the left, you can imagine that the shadow logically also appears to the lower right of the object as a whole (as it does in the sample to the right). However, that’s outside the image’s canvas, so that part of the shadow doesn’t appear in the artwork. Keep in mind that every layer in an image has the same number of pixels — but some of those pixels can be transparent. When a layer has areas of transparency, layers below in the image can show through. In the two examples, the yellow background layer is visible, giving the upper layer’s shadows a place to fall. And remember that a layer named Background can’t have areas of transparency. Convert it to a regular layer by double-clicking the layer name in the Layers panel and renaming it.